Jackie has always enjoyed the outdoors and being active. Growing up in San Diego, when she wasn’t camping in the Cuyamaca Mountains or in the Borrego Desert, she was swimming at La Jolla Shores or Pacific Beach. As a child, Jackie trained in various styles of dance, hoping to one day tap dance at Radio City. She discovered she would unfortunately never be tall enough to be a Rockette. At 40, she realized that life isn’t about perfection; it’s about progress. The progress of growing and turning challenges into learning opportunities and being empowered by what one does. For Jackie, this progress was rekindled when she resumed her active lifestyle. She began working at a women’s fitness center in her Outer Sunset neighborhood. Before long she was teaching circuit classes and managing a gym. She discovered Zumba Fitness in 2007 and was hooked. Jackie instantly fell in love with the music and knew this is what she was looking for. It allowed her to put her dance experience to use in a fitness environment…only with more fun, passion and sweat. 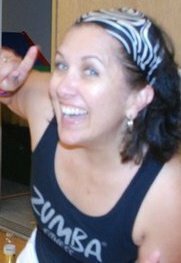 “Zumba Fitness allows me to let loose in a cool kind of way and enjoy the process of staying in shape. Everyone and anyone, regardless of their age or fitness level, can do a Zumba Fitness class,” says Jackie. Jackie is a certified YMCA Group Fitness Instructor, a YMCA Water Fitness Instructor, and has current certifications for: CPR Pro, AED, and Basic First Aid.